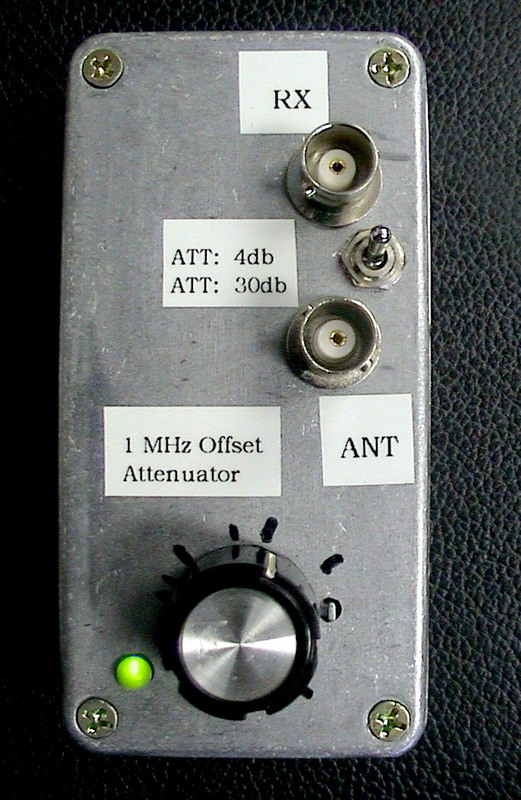 What is an "offset attenuator?" The "Offset Attenuator" in its die-cast enclosure. The "attenuation" control is incorporated with the power switch. The switch for the 30db attenuator switch is between the two BNC connectors. Suppose you have narrowed down the source of the signal to a city block. At this point it is impractical to drive much closer - all you can do is circle. Your mobile DF unit isn't particularly portable, so you can't use it on foot and the signal is so strong that no matter where you point your portable Yagi (which, on 2 meters, isn't particularly portable) you get a full-scale reading. You get out of your car, or off your motorcycle, or off your horse and start looking for the source of the signal on foot: You are now doing "close-in" DFing. One of the tools you can use to do this sort of direction-finding is the "Homing Circuit" - a device that will tell you whether or not the signal is to your left or right or even behind you. In close quarters, however, these devices are prone to being "fooled" by multiple reflections. In these cases it is nice to have a number of tools to use and a good 'ole signal level meter might be useful: The higher the reading, the closer you are to the transmitter's antenna. It would be handy to be able to use the S-meter in your radio to help find the signal, but these signal meters (usually a bar graph on an LCD display) have quite limited range - typically between 20 and 30 db - depending on the radio. Furthermore, these meters will often read "full scale" on signals that are not really very strong at all: The Yaesu FT-530's meter is quite typical - on 2 meters and 70cm it will typically read full scale with a signal level of just 5 microvolts! Reduce the amount of signal getting into the radio by removing the antenna. An obvious solution - but while this will certainly reduce the amount of signal getting into the receiver, if you are really close to the source of RF the signal may easily be strong enough to get into the radio (even without an antenna) and "pin" the S-meter. Mis-tune the receiver. Tuning the radio off-frequency by 10, 15 or even 20 KHz - putting the signal on the edges of the receiver's filters - can reduce the S-meter reading considerably. Even this method may not be satisfactory, however, when you are very close to the transmitter - especially if the signal is modulated inconsistently. Put it in a shielded enclosure. One other solution to this problem has been to put the receiver in an RF-tight box, using metal screens to allow receive audio to pass through and one can then carefully adjust the amount of RF that the receiver gets using conventional means (e.g. an outboard step attenuator.) While this method can work, it is rather awkward, as it is larger than the original radio and the controls may become inaccessible. If you use bushings, non-conductive shafts, and rubber bumpers to provide knob "extensions" you can operate the radio - but then you will likely have a box that will work only with that particular radio. An alternative to this is to lower your handie-talkie - with no antenna attached - into a length of metal tubing on a non-conductive string: The "deeper" it is in the tube, the less signal that it will get. With this, you can listen to the "hiss" as the signal is weaker which may allow you to get very close to the transmitter. There is another, rather simple, method that can be used to attenuate the signal for which you are looking: Move it somewhere else! Using a simple mixer circuit one can make the signal for which you are looking appear on another frequency. Why is this helpful? To provide this conversion, you would mix the signal being sought with a bit of signal from an offset oscillator and create a new signal: The more signal you supply from your offset oscillator, the stronger the new signal is and vice-versa. Conversely, if there were no signal from your offset oscillator, then there would (theoretically) be no offset signal. Typically, you would pick your offset oscillator to be a nice, even frequency- like 1 MHz or 4 MHz (that is, one that you can add/subtract in your head.) If, for example you were tracking a signal on 146.52 MHz and you used a 1 MHz offset oscillator, you would also be able to hear the 146.52 MHz signal 1 MHz away - on 145.52 and 147.52 (as well as progressively-weaker conversions on 144.52, 148.52, etc.) and you would pick whichever frequency was handiest and the most free of interference. Schematic of the "Offset Attenuator" Read the text below for details on the parts used. Note that the 146.52 MHz signal will also appear at 1 MHz intervals away from the original signal, such as 144.52, 143.52, 148.52, 149.52, etc. getting progressively weaker as you get farther away from the original signal. This isn't necessarily a bad thing, though, as you can pick one of these "new" signals that is weaker and allow you to select "copy" that is of appropriate signal strength. If your receiver has a tracking front end, you may also be able to prevent your receiver from being overloaded by the original signal by tuning far enough away so that the receiver's filters remove the original signal. Note that any signal that falls into your antenna will also be translated. In other words, there will be a lot of extra signals that will be created up and down the band: Most of these will be 1 MHz-spaced "replicas" but some of them may be seemingly-unrelated intermod products. You may have to pick and choose a "clear" 1 MHz step to find a "copy" of the signal that you are tracking if there are a lot of other transmitters nearby. If you are very close to the source of this signal, this usually isn't too much of a problem as the "attenuator" is usually set so high that those other signals just aren't a problem anyway. Another problem with an offset attenuator is that you will be able to hear harmonics of the offset oscillator in your receiver - signals that may obscure weaker signals that might just happen to be on the same frequency. For example, if you use a 1 MHz offset oscillator, you will hear a signal every 1 MHz (e.g. 144.0, 145.0, 146.0, 147.0, etc.) One way around this is to pick a higher frequency - such as 4 MHz for your offset oscillator: This will place the oscillator's harmonics on 144.0 and 148.0 - preventing any from falling within the 2 meter band. Occasionally, a radio may have a spurious response that just happens to land on or near the offset frequency. The presence of such a signal can easily be verified by turning off the offset mixer's oscillator and seeing of the signal goes away. If it does not, then one should be able to pick a different offset frequency on which the radio do not have a spurious response. Inside the enclosure. 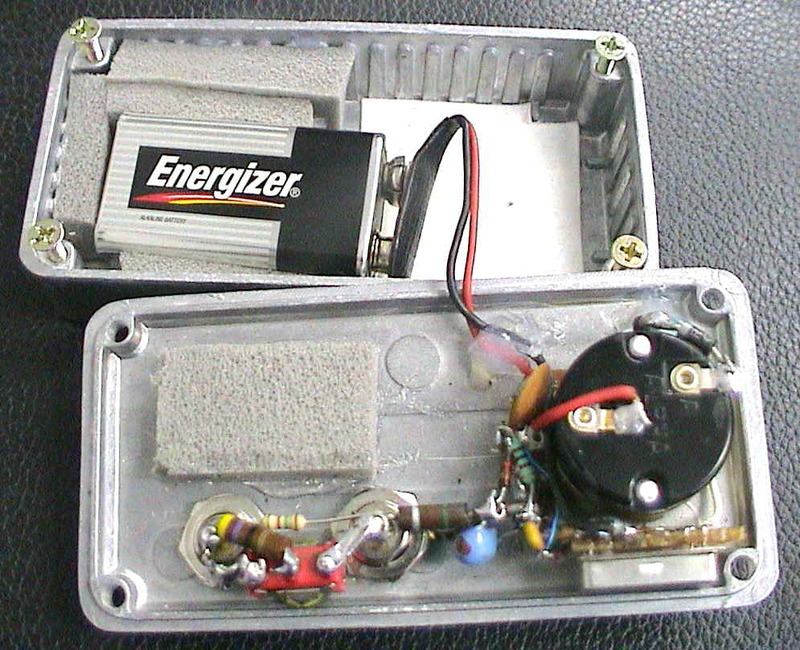 The battery is kept in place using weather stripping foam. The oscillator may be seen below the attenuator control. How does this help track signals then? By varying the amount of signal from the offset oscillator you can also vary the efficiency of the frequency conversion. Because the receiver is no longer tuned to the frequency of the original signal, the strength of that signal is dependent solely on the efficiency of that conversion. Simply by varying the signal level from the offset oscillator, you can adjust the effective strength of the converted, up and down, to keep it within the range of your radio's S-meter. In reality, you can vary the strength of the "new" signal from "full" (between 30 and 50 db down) to, for all practical purposes, infinity. That is, you can be right next to the transmitter, and still adjust for an on-scale S-meter reading. Another tactic for using the offset oscillator is to adjust the attenuation such that the received signal becomes very noisy: As you approach the signal (or aim the beam toward its source - if you are using one) the signal will become less noisy. This scheme has the advantage that it can be done by ear without having to stare constantly at the S-meter - which is particularly helpful if you are wandering around in the dark while looking for the signal. 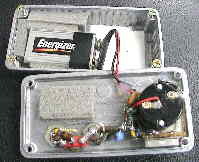 Power is supplied using a 9 volt battery, passed through the LED to a voltage regulator. The +5 volts output from the regulator provides a stable source of power for U2, the 1 MHz oscillator. Please note: Use only "normal" Red, Green, or Yellow LEDs as these have a voltage drop of between 1.9-2.1 volts. The "Ultra High Brightness" types (All blue, white and many green or yellow) have drops of 4 volts or so of drop and are unsuitable for this application. A close-up view of the connectors showing the switch and attenuator resistors, as well as the mixing diode and related components in the background. The output of U2, a 1 MHz "crystal can" oscillator, is filtered with L1 and C4 to provide 40-50 db of harmonic attenuation at 2 meters. The filtered signal is applied to one end of R1, a 5k linear taper potentiometer (on which the power switch is mounted) and the wiper of this pot goes to a 1k resistor, R2, which "flattens" out its "rotation versus attenuation" characteristics, preventing as many db of change from being "scrunched" into as small an angle of rotation. An audio taper pot may also be used - in which case you may not even need R2. Also connected to R1's wiper is D1, our mixer diode. Practically any diode will work to some degree, but a good, cheap device to use is the venerable 1N914 or 1N4148. Connected to the other side of this diode is L2: This coil provides a low-resistance DC ground path for the diode, but a high-impedance RF path Its value is not critical and could be practically anything from 4.7 uH to 220 uH. 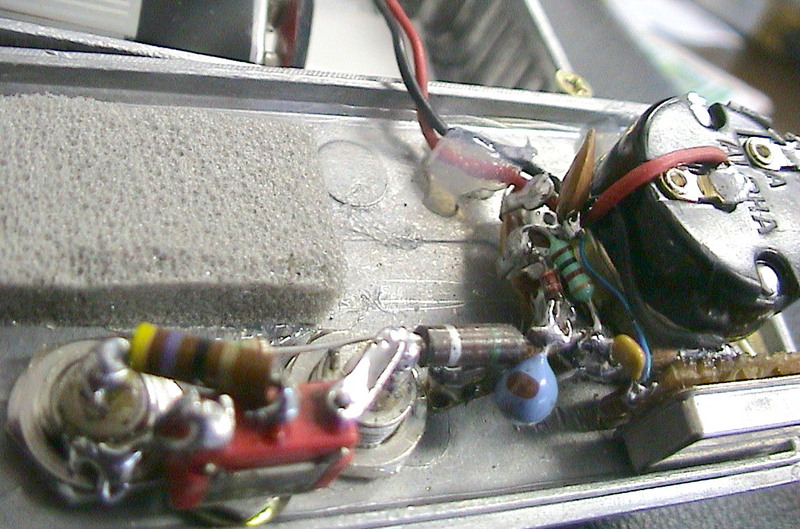 This end of the diode is coupled to the antenna terminals via R3, a 150 ohm resistor. The purpose of this resistor is largely to prevent the diode/potentiometer from being destroyed if one accidentally transmits "through" this unit. In the prototype, no damage was done by brief (2-3 second) transmissions of 5 watts. S2 switches a simple attenuator in and out. When in the "out" position R4, the 47 ohm resistor is in parallel with the 1.5k resistor (R5) and that total resistance is placed between J1 (the "Receiver" port) and J2 (the "Antenna" port.) The attenuation caused by this resistance is typically in the range of 4 and 6 db, depending on a number of factors such as cable lengths and antenna/receiver characteristics. When S2 is in the "-30db" position, the "bottom" end of R4 is grounded and the received signal is attenuated by approximately 30db. Comment: R4, the 47 ohm resistor, is stated as being a 1/2 watt unit only so that it can withstand a few seconds of being accidentally transmitted-into at several watts of transmitter power. A 1/4 watt unit can be used if you are quite sure that you won't be transmitting into it - but even that should survive very brief "accidental" bumps of the push-to-talk button on your radio. This attenuator is extremely simple - and is, in fact, not a "true" 50 ohm attenuator. Also, when the switch is in the "out" position, there is still some attenuation in line. Do we care? Not really: If you are so close to the transmitter than you need to be using the offset attenuator box anyway, the extra 4-6 db of loss is irrelevant. The 30db attenuation isn't precise, but its sole purpose is to knock the signal way down and prevent receiver overload (see the sidebar below.) Note: If you were to use a DPDT switch, you could completely avoid the intrinsic 4db loss of this circuit and use a "true" 50 ohm attenuator. A simple SPDT switch was used because it was available, and this one had a very short handle. There is at least one situation that could cause you chase your tail when using an offset attenuator. This can happen when you are very close in proximity to the source of the signal. Front end overload! What happens is this: You have tuned in the signal for which you are looking, say, 1 MHz away. As you get closer to the source, this offset signal also gets stronger - but so does the original. In this case, you dutifully turn "up" the attenuation to compensate. Doing so has no effect on the original signal, however. As you get even closer, it is possible that the RF stages (and mixer) in your receiver are starting to overload. As this happens, the receiver will become less sensitive to other signals - including the offset signal being generated by the offset attenuator - which seems to start to get weaker. This effect is often called blocking. The result? The closer you get to the source of the signal, the lower the reading you may get from the offset signal. This can, of course, greatly confuse the attempt at locating the signal. If your receiver has a "tracking" front end (and many of them do) you can tune in an offset signal that is 10 or 20 MHz (or more) away. The filters in your receiver may adequately reject the original signal to prevent significant overload. Since you are so close to the source, you should have plenty of signal to get a reading to overcome the additional attenuation caused by picking an offset signal so far removed from the original. Put additional attenuation between your antenna and the original signal. This will reduce the level of the signal getting into the front end of your radio and prevent overload. It is unlikely that the amount of leakage directly into the radio will be enough to cause the radio to overload. It may be possible to remove the antenna from the offset attenuator, letting signal get into the receiver directly. As long as some of that signal gets back into the offset attenuator as well it will still provide an offset signal. Experimentation is required to determine if this method will work with your radio. Because the described unit has an attenuator already built in, #2 is, of course, the most convenient. For the bands 6 meters through 222 MHz, the minimum attenuation of the offset attenuator is about 30 db - going up to about 50 db on 70cm. This frequency response characteristic is most likely a result of the properties of the diode itself: A microwave Schottky diode (like an HP 5082-2835) will likely provide more consistent performance across the VHF and UHF range, but is likely to be much more fragile than the (cheaper) 1N914/1N4148. The attenuation/mixer characteristics will be very strongly dependent on the diode you choose! The maximum (and minimum) attenuation will also depend on which "offset" you pick. If you picked something 1 MHz away, attenuation of 90 db or more should be easily obtainable. This may not be enough if the transmitter you seek is high powered and/or very very close to you. In this case, moving 1 MHz farther away will reduce the signal even more. In the unlikely event that that was still inadequate attenuation, you could move still farther away (in 1 MHz steps) from the original signal. The addition of L1 and C4 reduced the amount of 1 MHz harmonic energy by between 40 and 50db on 2 meters by removing many of the harmonics of the 1 MHz oscillator. These harmonics may actually be weak enough that they will not cause a full-scale S-meter reading, allowing use of this device to locate a transmitter on an even 1 MHz harmonic. If it is desired, one may use a higher frequency oscillator (such as 2 or 4 MHz) to reduce the number of frequencies within the band that will be covered by the harmonics. A change of oscillator frequency will, of course, require that the values of L1 and C4 be modified - or, if the presence of strong harmonics doesn't bother you, removed altogether. If a 4 MHz oscillator is being used, suggested values for L1 and C4 are noted on the schematic. With the advent of very inexpensive (less than $100) Chinese-made radios there has arisen an issue when they might be used with an offset attenuator. Many of these radios (e.g. Baofeng) use a single "transceiver on a chip" for all receive and transmit functions including IF filtering, frequency synthesis and demodulation, leaving only the RF preamplifier and filtering and transmit power amplifier functions to external components. While these "radio on a chip" devices work quite well under most circumstances, they will sometimes fail in the presence of a strong, off-frequency signal. It is precisely this condition that can occur when when is using an "offset converter" and is getting close to the transmitter. When some distance away from the transmitter (perhaps hundreds of yard/meters) everything may be fine: One keeps adding attenuation using the control..
As one gets closer to the transmitter its on-frequency signal gets stronger and stronger. At some point, when the original transmit signal - which may be several MHz away from where the receiver is actually tuned to the "converted" signal by the offset attenuator, gets too strong the all-in-one radio chip will start to overload, causing the signal converted by the offset attenuator - the one being monitored by the user - to seem to get weaker. Because the converted signal is getting weaker, it will erroneously indicate that one is getting farther from the transmitter, causing a great deal of confusion. Use a different radio. If you have an older "conventional" radio (say, something 10+ years old from a different manufacturer) you should use that, instead. If this is a dual-band radio and the signal that you are seeing is on 2 meters, tune in the 3rd harmonic and use that instead. If you are very close to the transmitter this harmonic should be easily heard. A somewhat technical solution would be to use a distant mixing product from the offset converter (say, 10-20 MHz away from the original signal) and place a bandpass filter tuned for that converted product (or a notch filter tuned to the original signal) between the offset converter and the radio to protect the radio from that original signal. Want to send an email to KA7OEI? Click here. Note: Neither the author or UARC officially endorse any vendors mentioned above. The level and satisfaction of performance of any of the above circuits is largely based on the skill and experience of the operator. Your mileage may vary.